Imagine: you have a rifle platoon at your command. These highly skilled soldiers are trained to operate in all environments and all types of conflict. Your troops rely on you for leadership, guidance and support, on operations and exercises, wherever you are in the world. It’s not just about management, operations and logistics. You are responsible for your troops’ morale, welfare and career development. On the front line, their lives are in your hands. If it sounds daunting, don’t worry: 15 months of intensive training will teach you everything you need to know. 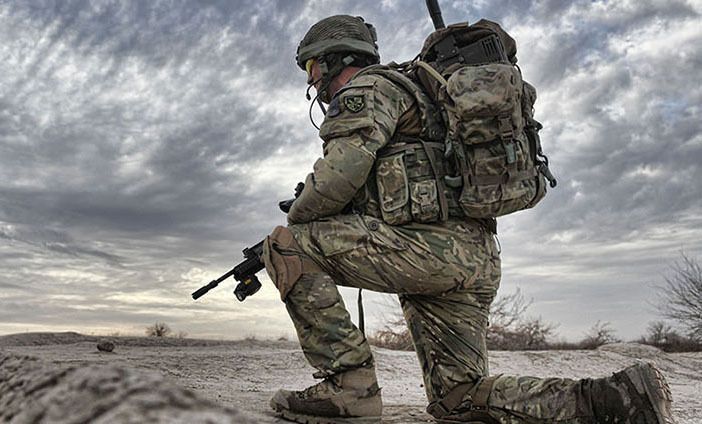 Think you could be an Infantry Officer? Command highly trained frontline soldiers as an Infantry Platoon Commander . Deploy around the world on everything from front line operations to disaster relief missions. Serve in one of nineteen Infantry Regiments. Each has its own unique history and identity. Get trained in Armoured, Airborne, Mechanised, Light Mechanised or Light Role tactics. Specialise as a Company Second in Command, Anti-Tank, Mortar, Reconnaissance, Intelligence or Communications Officer further down the line. You begin with Officer training at the Royal Military Academy Sandhurst, which lasts for 44 weeks. You learn what’s expected of a British Army Officer and how to lead soldiers on and off the battlefield. If you join an Infantry regiment you go on to do the 16-week Platoon Commanders Battle Course in Brecon, Wales. After this, you'll be a capable tactician, as well as physically and mentally robust. "I believe my experience in the Army to date is reflective of what Infantry officers are experiencing across the Regiments - challenging, interesting and varied tasks across the globe. I am extremely proud to serve as an Infantry officer and work alongside soldiers who demand the highest level of professionalism from themselves and those around them. The opportunities offered by the Army, especially for Infantry officers, remain unparalleled. There is the added bonus of living and training alongside your closest friends." QUALIFICATIONS: 72 UCAS points and 35 ALIS points at GCSE, (including at least grade C/4 in English, Maths and a science or foreign language). Once your online application has been approved, you'll have an interview with a senior recruiter, who will talk to you about the corps that you would like to join. You'll have the chance to learn more about your chosen corps, although you won't make your final decision until you're in training at Sandhurst.